Oryctes rhinoceros is one of the most serious pests of the coconut palm. Oryctes rhinoceros also has a record of damage, wherever it has become established in the tropics, to native palm trees and native Pandanus. Imagos of Oryctes rhinoceros are large 30-5mm long and 14-21mm breadth, black or reddish black in colour, stout and possesses a characteristic cephalic horn which is larger in males. The pygedium is densely clothed with reddish brown hairs on the ventral surface in the female (Nirula, et. al., 1952) a feature which helps in distinguishing it from the male. Please see PaDIL (Pests and Diseases Image Library) Species Content Page Beetles: Coconut rhinoceros beetle for high quality diagnostic and overview images. The duration of immature stages of Oryctes rhinoceros has been studied by various authors under differing conditions. Whitish brown eggs are 3 to 4mm long and take 8 to12 days to hatch. Developmental period is 1St instar larvae 10 to 21 days , 2nd instar larvae 12 to 21 days, 3rd larvae 60 to 165 days , pre-pupae 8 to 13 days and pupae 17 to 28 days (Bedford, 1976a; Catley 1969; Cherian and Anantanarayanan 1939; Goonewardena, 1958; Gressitt 1953; Hinckley 1973; Kurian and Pillai, 1964; Nirula 1955). 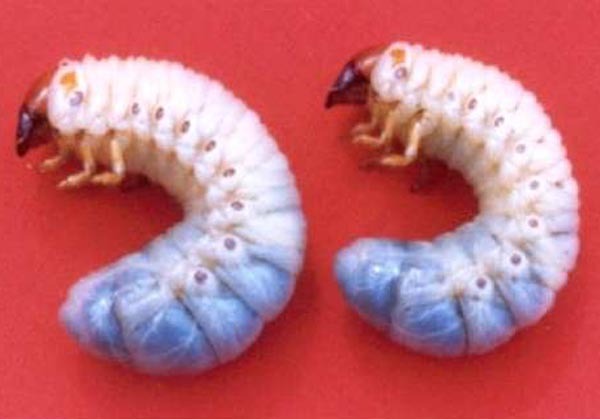 Mature larvae are C- shaped, with brown head capsule and legs. The imagoes remain in the cocoon for about 11 to 20 days (Lever, 1979). Mating occurs in breeding sites (Zelazny, 1975).The life cycle lasts from 4 to 9 months allowing more than one generation per year. In India average adult longevity is about 4.7 months and fecundity per female is 108 eggs (Nirula, 1955). Life history data for Oryctes, and related species like Scapanus, and Strategus are summarised by Bedford (1980). Thought to be native to the southern Asiatic region, the coconut rhinoceros beetle was introduced throughout the Pacific primarily as a result of the increased sea traffic during World War II (Nishida & Evenhuis, 2000). The beetle breeds in dead standing coconut palms killed by pest /disease/ lightning, decaying organic materials like compost and sawdust heaps. (Bedford, 1980). Decaying pandanus trunk in Palau (Gressitt, 1953) and heaps of decaying cocoa pod shells in New Ireland (Bedford, 1976a) are also reported as breeding sites. In India (Kurian and Pillai, 1964; Nirula, et al. 1952) and Mauritius (Monty, 1978) heaps of cattle-dung were the most important breeding sites, in Burma dead coconut stems, heaps of rotting paddy straw and farm yard manure were most important (Ghosh, 1923). Floating logs containing larvae in tunnels might spread the pest to new areas (Bedford, 1980). Mating occurs in breeding sites (Zelazny, 1975). The female coconut rhinoceros beetle burrows into rotting stumps, standing palms and rubbish piles to lay her eggs. The life cycle lasts from 4 to 9 months allowing more than one generation per year. In India average adult longevity is about 4.7 months and fecundity per female is 108 eggs (Nirula, 1955). It is believed to have been introduced in rubber seedling pot plants from Ceylon (Sri Lanka) to the Pacific island of Upolu, Western Samoa in 1909Oryctes rhinoceros L. has been found alive in an aircraft hold and also in a polystyrene box containing tissue culture flasks from South East Asia.The beetle breeds in decaying organic materials like compost and sawdust heaps. Transportation of this material could be a pathway of introduction to new areas.Introduced throughout the Pacific primarily as a result of the increased sea traffic during World War II, (Nishida & Evenhuis, 2000). Recommended citation: Global Invasive Species Database (2019) Species profile: Oryctes rhinoceros. Downloaded from http://www.iucngisd.org/gisd/species.php?sc=173 on 21-04-2019. There are natural factors that keep the beetle under control in its native range, its introduction into insular habitats without these natural control factors allows it to reproduce quickly and spread to become a serious pest (Nishida & Evenhuis, 2000). The coconut rhinoceros beetle is one of the most damaging insects to coconut palms and African oil palm in southern and south- east Asia and the Western Pacific islands. The imagos are the destructive stage, they bore into the crown of the palm resulting in wedge shaped or \"V\" cuts in the fronds that unfurl. The beetle feeds on tissue juices. Some of the crushed fibre is pushed outside the entrance hole, where it indicates the insect’s presence. In India damage of inflorescence is also reported in severely infested areas which cause reduction in yield up to 10% (Nair, 1986). Ramachandran et al. (1963) has reported a loss in yield of 5.5 to 9.1% due to beetle attack. From artificially pruned leaf damage stimulation studies it was observed that damage to 50% fronds corresponds to leaf area reduction of 13% and decrease in nut yield by 23% (Young, 1974). In oil palm O. rhinoceros bores into the base of cluster of spears, causing wedge shaped cuts in the unfolded fronds. In younger palms the effect of damage can be much more severe (Wood, 1968; 1976). Attack by adults may reduce yield and kill seedlings. They may provide entry points for lethal secondary attacks by the palm weevil Rhyncophorus or by other pathogens, in some countries (Bedford, 1980). Apart from coconut and African oil palm recorded host plants include the date palm and a variety of palms grown for ornamental purpose, including Roystonea regia, Livistona chinensis, Corypha umbraculifera and Raphia ruffia (Gressitt, 1953; Bedford,1980); also recorded are pine apple, sugarcane, pandanus and banana (Lever, 1979). Integrated management: Integrated control measures adopted on a community basis are essential to bring an effective control of an Oryctes rhinoceros population. The major components of the Integrated Pest Management Package consist of mechanical, chemical and biological methods. Mechanical methods consist of examing trees for infestation and removing the beetle physically. Prophylactic methods (preventive measures) include the use of pesticides, napthalene balls etc. to repel the beetles. Oil cakes of neem and marotti (Hydnocarpus wightiana) have also provided good results. Biological: Biological control of the beetle is the most important component of the IPM package. The green Muscardine fungus Metarhizium anisopliae M. is a pathogen which kills the pest in conditions of low temperature and high humidity. The viral pathogen Baculovirus of Oryctes (OBV) is very effective and kills the grub in 15-20 days of infestation and it affects the longevity and fecundity of adult beetles. Insect predators are frequently observed in the natural breeding grounds of the beetle, which feed on the eggs and early instar larvae of the beetle. The important predators are Santalus parallelus Payk., Pheropsophus occipitalis Macleay, P. lissoderus, Chelisoches morio (Fab.) and species of Scarites, Harpalus and Agrypnus. As these predators help in the natural check of the pest population, conservation of the predator fauna is essential. Restricting and managing the breeding sites could check the proliferation of the pest. Proper disposal of breeding grounds and field sanitation are important steps in IPM of Oryctes. An effective trapping method with rotting castor cake slurry kept in mud pots has been developed for rhinoceros beetle. More details are available from Integrated Pest Management Information Package. A list of control options from Controlling rhinoceros beetle in coconut: India an article in 'The Hindu' July 7 2005. Collection and destruction of various bio-stages of the beetle from the manure pits. Incorporation of the entomopathogenic fungus, Metarhizium anisopliae in manure pits to check the perpetuation of the pest. Soaking of castor cake at 1kg in 5 litres of water in small mud pots and placing them in coconut gardens to attract and kill the adults. Longitudinally split tender coconut stem and green petiole of fronds can be treated with fresh toddy and kept in the garden to trap the beetles. Setting up of light traps following the first rains in summer and monsoon. Mixture of either neem seed powder + sand (1:2) at 150 g per palm or neem seed kernel powder + sand (1:2) at 150 g per palm applied in the base of the 3 innermost leaves in the crown effectively controls the pest. (Ramaraju & Pretheep Kumar., July 7th 2005). Please follow this link Ecoport: Macfarlane (2006) for more details on the signs and symptoms of infestation and management options. Informations on Oryctes rhinoceros has been recorded for the following locations. Click on the name for additional informations. Anonymous. 1952. Insect Consultants Committee for Micronesia (ICCM). Annual Report of the Pacific Science Board, 6: 28�36. Anonymous. 1953. Insect Consultants Committee for Micronesia (ICCM). Annual Report of the Pacific Science Board, 7: 21�28. Antony, J. and Kurian, C. 1966. Biology of the histerid beetle Hister (Santalus) orientalis Payk. A predator of Oryctes. Proc. 53rd Indian Science Congress Part III p. 362. Bedford, G.O. 1980. Biology, Ecology and control of palm Rhinoceros beetle. Ann. Rev. Entomol, 26, 213. Biju, B., Sudhadevi, K., Danger, T.K. and Sathiamma, B. 1995. Biological suppression of Oryctes rhinoceros by re-releases of Baculovirus oryctes in an infected contiguous area. J. Plantn Crops 23: 62 � 63. Chandrika, M. and Nair, C.P.R. 2000. 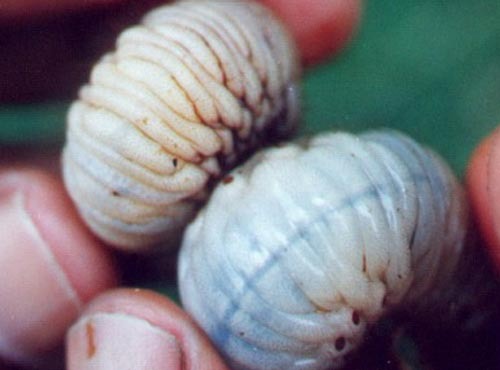 Effect of Clerodendron infortunatum on grubs of coconut rhinoceros beetle, Oryctes rhinoceros . Recent advances in Plantation Crops Research 2000, pp. 297-299. (Eds) N. Muraleedharan and R. Rajkumar. Allied Publishers Ltd, New Delhi. Chandrika, M., Nair, C.P.R. and Rajan, P. 2001. Scope of botanical pesticides in the management of Oryctes rhinoceros L. and Rhynchophorus ferrugineus Oliv. Affecting coconut palm. Entomon 26 (spl. Issue): 47-51. Dangar, T. K., Geetha, L., Jayapal, S.P. and Pillai, G.B. 1991. Mass production of entomopathogen Metarhizium anisopliae in coconut water wasted from copra making industry. J. Plantn Crops 19(1): 54 � 69. F�d�ration d�partementale des groupements de d�fense contre les organismes nuisibles- R�union. Summary: Note de synth�se sur l Oryctes rhinoceros. Gopal, M., Gupta, A., Sathiamma, B. and Radhakrishnan Nair, C. P. 2001. Review Article - Control of the Coconut Pest Oryctes rhinoceros L. Using the Oryctes Virus. Insect Science and its Application 21(2): 93-101. Summary: The coconut palm is an important plantation crop in India, where it is cultivated on 1.796 million hectares. The rhinoceros beetle, Oryctes rhinoceros L. (Coleoptera: Scarabaeidae) is a serious pest of coconut throughout India and southeast Asia, causing an estimated 10% yield loss in the crop. Successful biological control of this pest could be achieved using the non-occluded Oryctes virus (syn. Baculovirus oryctes or Oryctes baculovirus). This review provides an account of this microbial agent, its biology, effects and impact, production and maintenance and alternative hosts, particularly in the context of the Indian situation. It also proposes future areas for investigation on the virus, in order to achieve its commercial viability and more widespread use. Gorick, B.D. 1980. Release and establishment of the Baculovirus disease of Oryctes rhinoceros (L.) (Coleoptera: Scarabaeidae) in Papua New Guinea. Bull. Ent. Res. 70 (3): 445-453. Gurmit Singh 1987. Naphthalene balls for the protection of coconut and oil palm against Oryctes rhinoceros L. Planter 63 (2): 286-92. Hallet, R.H., Perez, A.L., Gries, G., Gries, R., Pierce, H.D. Jr., Yue-JunMing, Oehlschlager, A.C., Gonzalez, L. M., Borden, J.H. and Yue, J.M. 1995. Aggregation pheromone on coconut rhinoceros beetle, Oryctes rhinoceros L. (Coleoptera: Scrabaeidae) .J. Chemical Ecology 21(10): 1549-1570. Huger, A.M. 1966. A virus disease of the Indian rhinoceros beetle, Oryctes rhinoceros (Linaeus) , caused by a new type of insect virus, Rhaddionvirus oryctes gen.n. sp.n. J. Invertebr. Pathol. 8: 38-41. Jacob, T.K. 1996. Introduction and establishment of Baculovirus for the control of rhinoceros beetle Oryctes rhinoceros (Coleoptera: Scarabaeidae) in the Andaman Islands (India). Bull. Ent. Res. 86: 257-262. Jayaraman,V. 1985. 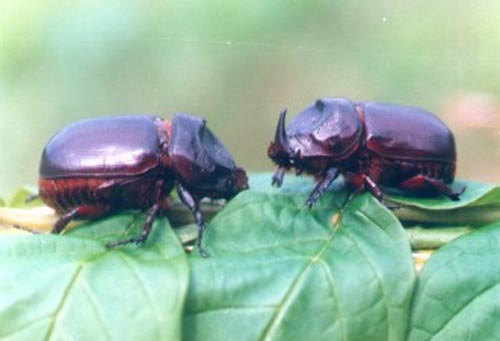 Study on repellant action of phorate against rhinoceros beetle, Oryctes rhinoceros Linn. In: Behavioural and physiological approaches in pest management. A, Reghupathy and S. Jayaraj. (Eds) TNAU Coimbatore. pp. 116-119. Kurian, C., Pillai, G.B., Antony, J., Abraham, V.A. and Natarajan, P. 1983. Biological control of insect pest of coconut. In. Coconut Research and Development. Proc. of the International Symposium I. CPCRI, Kasaragod. Dec 27-31, 1976. (ed. N.M. Nair) Wiley Eastern. New Delhi p.361-375. Lomer, C.J. A.D. 1986. Release of Baculovirus Oryctes into Oryctes monoceros population in the Seychelles. J. Invertebr.Pathol. 47(3): 237-246. Mohan, K.S. and Pillai, G.B. 1982. A method for lab. scale mass cultivation of Metarhizium anisopliae . Folia Microbiol. 27: 281-283. Mohan, K.S. and Pillai, G.B. 1993. Biological control of Oryctes rhinoceros (L.) using an Indian isolate of Oryctes baculovirus. Insect Sci. Applic.14 (5-6): 551-558. Mohan, K.S., Jayapal, S.P. and Pillai, G.B. 1983. Baculovirus disease in Oryctes rhinoceros population in Kerala. J. Plantn Crops 11 (2): 154-161. Mohan, K.S., Jayapal, S.P. and Pillai, G.B. 1985a. 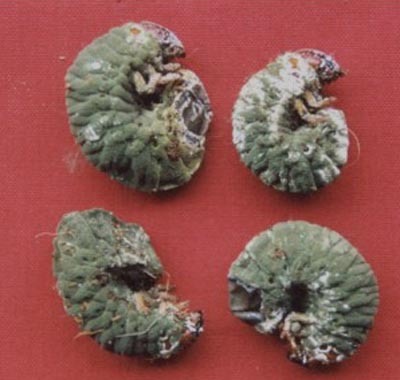 Response of Oryctes rhinoceros larvae to infection by Oryctes baculovirus. J. Plantn Crops 13 (2): 116-124. Mohan, K.S., Jayapal, S.P. and Pillai, G.B. 1985b. Diagnosis of baculovirus infection in coconut rhinoceros beetles by examination of excreta. Z. Pflkranh. Pflschutz. 93 (4): 379-383. Monty, J. 1978. The coconut palm rhinoceros beetle, Oryctes rhinoceros L. (Col., Dynastidae) in Mauritius and its control. Revue Agricole et Sucriere de I�lle Maurice. 57 (2): 60-76. Nair, C.P.R., Daniel,M. and Ponnamma, K.N. 1997. Integrated Pest Management in palms; Eds. Nambiar, K.K.N and Nair, M.K. Coconut Development Board, Kochi, India. pp. 30. Nirula, K.K., Radha, K. and Menon, K.P.V. 1955. The green muscardine disease of Oryctes rhinoceros L. I. Symptomatology, epizootology and economic importance. Ind. Cocon. J. 9: 3-10. Nirula, K.K., Radha, K. and Menon, K.P.V. 1956. The green muscardine disease of Oryctes rhinoceros L. II. The causal organism. Ind. Cocon. J. 9 (2): 83-89. Pacific Pest Info Newsletter. Published by the Secretariat of the Pacific Community: Plant Protection Service, Private Mail Bag, Suva, Fiji Islands. Tel: (679) 3370-733; Fax: (679) 3370-021. Pacific Pest Info No. 59, May 2005. ISSN: 1728-5291. Secretariat of the Pacific Community, Plant Protection Service. Pacific Pest Info No. 60, June-July 2005. ISSN: 1728-5291. Secretariat of the Pacific Community, Plant Protection Service. Pillai, G.B., Sathiamma, B. and Danger, T.K. 1993. Integrated control of rhinoceros beetle. Pp 455 � 463. In Advances in coconut research and development (Eds.) Nair, M.K., Khan, H.H., Gopalasundaram, P and Bhaskara Rao, E.V.V. Oxford & IBH Publishing Co. Pvt. Ltd, New Delhi. Purrini, K. 1989. Baculovirus oryctes release into Oryctes monoceros population in Tanzania , with special reference to the interaction of virus isolates used in our laboratory infection experiments. J. Invertebrate Pathology 53(3) :285-300. Ramachandran, C.P., Kurien, C. and Mathew, J. 1963 . 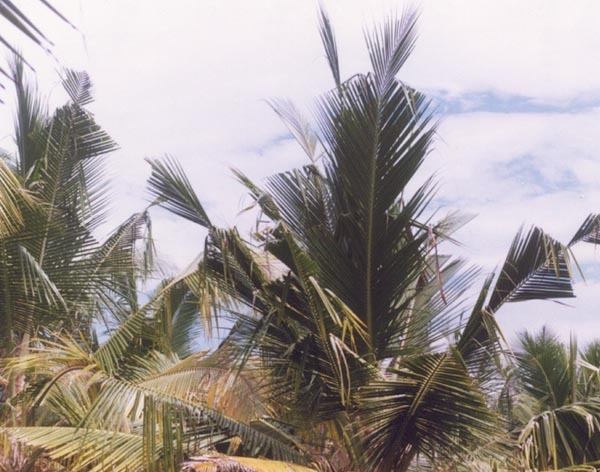 Assessment of damage to coconut due to Oryctes rhinoceros L. Nature and damage caused by the beetle and factors involved in the estimation of loss. Indian Cocon J. 17 : 3-12. Ramaraju, K. & Pretheep Kumar, P. Tamil Nadu Agricultural University, Coimbatore July 7th 2005., in The Hindu . Controlling rhinoceros beetle in coconut: India. Sadakathulla, S. and Ramachandran, T.K. 1990. Efficacy of naphthalene balls in the control of rhinoceros beetle attacks in coconut. Cocos 8:23-25. Swaine ,G.. 1966. Fiji�s campaign against the coconut rhinoceros beetle. Int. Pest Control. 8 : 6-9 . Swan, D. I. 1974. A review of the work on predators, parasites and pathogens for the control of Oryctes rhinoceros (L.) (Coleoptera: carabaeidae) in the Pacific area. Commonwealth Agriculture Bureaux Miscellanous Publication no. 7, 64pp. Wood, B.J. 1968. Pests of oil palm in Malaysia and their control .Kuala Lumpur : Inc.Soc.Planters 204 pp. Young, E.C. 1974. The epizootiology of two pathogens of the coconut palm Rhinoceros beetle. J. Inverbrt. Pathol. 24:82-92. Zelazny, B. 1981. India- presence of Baculovirus of Oryctes rhinoceros FAO Plant Prot. Bull. 29 (3/4): 77-78. Catley, A. 1969. The coconut rhinoceros beetle, Oryctes rhinoceros (L.) PANS 15: 18-30. Cheriyan, M.C. and Ananthanarayanan, K.P. 1939. Studies on the coconut palm beetle (Oryctes rhinoceros Linn.) in South India. Indian J. Agric. Sci. 9: 541-59. CPCRI, 1990. Annual Report, 1989-90. Central Plantation Crops Research. Institute. Kasaragod, India.. pp 85-89. Dumbleton. F. C. 1952. Rhinoceros beetle in the Kingdom of Tonga. South Pac. Comm. Tech. Pap. No. 34. 7pp. Ghosh, C.C. 1923. Oryctes rhinoceros and other important palm pests in Burma Proc. 5th Entomol.Meet. Pusa ,pp.99-103. Goonewardena , H.F. 1958. The rhinoceros beetle (Oryctes rhinoceros Linn. ) in Ceylon Introduction, distribution and life history. Trop. Agric. Ceylon 114: 39-60. Gressitt, J. L. 1953. The coconut rhinoceros beetle (Oryctes rhinoceros) with particular reference to the Palau Islands. Bishop Museum Bulletin no. 212: 1�157. Hinckley, A.D. 1973. Ecology of the coconut rhinoceros beetle Oryctes rhinoceros (L.). Biotropica 5:11-16. Kurian, C., Pillai, G.B., 1964. Rhinoceros beetle, a major menace to coconut cultivation . World Crops 16:20-24. Lever, R.J.A.W. 1979. Pests of Coconut Palm. FAO agricultural Studies No 77. Food and Agricultural Organization of the United Nations, Rome. McKenna, J., Shroff, K. D. 1911. The rhinoceros beetle (Oryctes rhinoceros Linn. )and its ravages in Burma, Burma Dept. Agric. Bull. No. 4 (1910) 6pp. Nair, M.R.G.K. 1986. Insects and mites of crops of India. Indian Council of Agricultural Research (ICAR). New Delhi, India p. 83. Nirula, K.K., Antony, J. and Menon, K.P.V. 1952. The rhinoceros beetle (Oryctes rhinoceros L.) life history and habits. Indian Cocon. J.V (2). Orian, A.J.P. 1959. Report on a visit to Diego Garcia. Rev. Agr. Sucr. Ile. Maurice 38: 127-43. Wood, B.J. 1976. In . Oil Palm Research .ed . R. H. V. Corley, J.J. Hardon, B.J. Wood . pp 347-67. Amsterdam; Elsevier 532 pp. Research work: Standardized sampling technique for white grubs affecting coconut; Investigated bioecology and chemical control for coconut white grubs; Botanical oil cakes for prophylactic leaf axil filling against Oryctes and red weevil; Treatment of breeding sites of Oryctes rhinoceros with Clerodendron infortunatum as one of the components in IPM; Field demonstration of biocontrol of Opisina in farmers� plot; Lab. multiplication technique for Apanteles taragamae and recorded Galleria mellonella as host for Corcyra.